Yesterday I was at Rhyl Town Hall for the Welsh Labour Deputy Leader Hustings between Carolyn Harris and Julie Morgan. 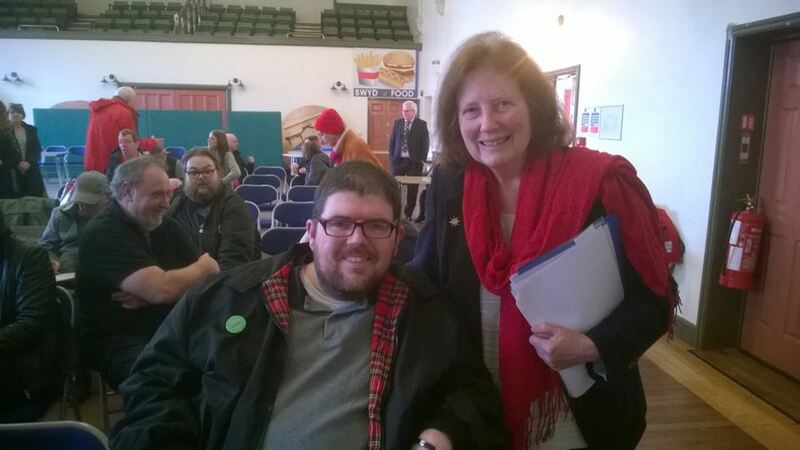 I attended the meeting with an open mind but emerged as a staunch supporter of Julie Morgan. Both candidates were asked a set of six questions that had been submitted before the hustings, including mine which asked where the candidates stood on the future of the Welsh Independent Living Grant. Harris was the first to answer this and I was almost deafened by the sound of jaws hitting the floor when she claimed that we should trust the Local Authorities to sort the issue out. She received a frosty reception after this answer and all I could hear was a bundle of tumbleweed lightly skimming the surface of the stage. Julie answered the same question by announcing that she would press for an inquiry into the matter and that the Welsh Assembly needs to recognise that it does not always make the right decisions. Queue rapturous applause. Everyone at the SaveWILG campaign is rooting for Julie to become the next Deputy Leader of Welsh Labour as she is true socialist and really cares about disabled people and the future of independent living. I have included a link below to an interview with Julie Morgan that appeared on the Skwawkbox blog. It is a wonderful read. The Labour Party in Wales is in the middle of a historic campaign to elect its first ever deputy leader. Both of the candidates are women, both from the broad left of the party – and both have served as MPs. But only one supports the Welsh party switching to OMOV – one member, one vote – to empower Labour members in the election of their leadership, instead of the ‘electoral college’ system pushed through by the Welsh Executive in what many consider to be an attempt to protect the ‘centrist’-dominated power structure, which gives a handful of MPs and Assembly Members the same voting power as all Welsh Labour members.